A dress is the perfect piece for every occasion! I've found the perfect printed maxi for all your summer events. I love this Adrianna Papell stripped maxi dress because of the bright bold colors and the shape is very flattering. I really like how the stripes are vertical, it helps elongate a petite frame. I love wearing color all year round but this blue/ green color combo is super saturated, making it perfect for the summer. The brighter, the better! 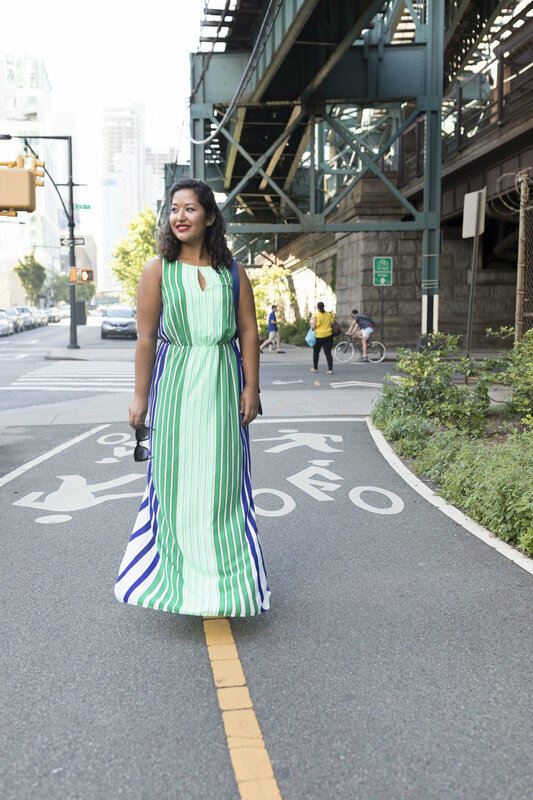 This maxi is lightweight, which makes it possible to survive the summer heat. It also has two side slits and the lining ends around the knees, creating an illusion at the hem. Pair this colorful dress with fun colored accessories to really make this a festive look. Shop the dress below.